One of the unanticipated consequences of the recent partial government shutdown has been the multiple stories in the media of things government does that are generally invisible to the public and unappreciated. For example, CNN cataloged 102 effects of the shutdown, such as the inability to approve corporate mergers, the lack of food inspectors, pollution inspectors, airline safety inspectors, identify theft investigators, and the inability to issue flood insurance policies. But once memories of the shutdown fade, what can be done to continue the public’s awareness in the invisible efforts of government? There are a number of attempts, some long-running and some that are new. The Department Of Agriculture Annual Performance Report (FY 2017 is the most current available and is combined with its FY 2019 Performance Plan, at 62 pages) starts with a lofty strategic goal to “Ensure USDA programs are delivered efficiently, effectively, with integrity and a focus on customer service.” And its first key measure of this is to modernize its IT infrastructure by reducing the number of Tier 1 data centers. Yes, this is important, but it doesn’t feed the hungry or prevent crop failures from disease. The department does do this, but these accomplishments are buried in the report. The Department of Housing and Urban Development Annual Performance Report (FY 2017 is the most current information available and is combined with its FY 2019 Performance Plan, at 121 pages). The department set an FY 2017 target of reducing the number of families experiencing homelessness to not exceed 53,000 individuals. The most current data in its report is for FY 2016.This is not helpful to policymakers or program managers in 2019! The Department of Justice Annual Performance Report (FY 2017 is the most current available and is combined with its FY 2019 Performance Plan, at 66 pages). The department set an FY 2017 target of disrupting 200 terrorist incidents and exceeded the goal by disrupting 723. The actual number of incidents in FY 2016 was 460, so the FY 2017 target of 200 was probably an easy win, nevertheless this was an important success story to tell widely. An Improvement. In the past, even finding these reports required a good deal of perseverance. The good news is that there is now a governmentwide platform – performance.gov -- that serves as a one-stop shop for all of these reports and additional information. 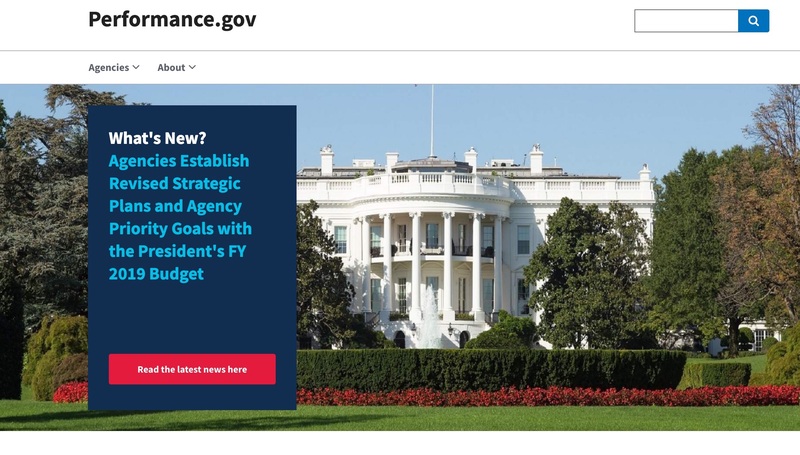 This site was mandated by law in 2010 and bills itself as “a window into Federal agencies’ efforts to deliver a smarter, leaner, and more effective government.” Several years ago, it was critiqued by GAO for not meeting basic criteria for user-friendly websites. It undertook an extensive re-design has recently become a much more useful site, both in its content and how government leaders are using it to get helpful information into the hands of the public and stakeholders. In addition, OMB is now actively using social media to share this information proactively via Twitter, and this is amplified by OMB’s deputy director for management, Margaret Weichert. A New Cutting-Edge Approach. There is a new pioneer, though, who is pushing the envelope! Like many other agencies, the Veterans Benefits Administration publishes a traditional annual performance report. And like many others, their latest publicly available report is for FY 2017. However, unlike most other agencies, the Veterans Benefits Administration also publishes a Weekly Monday Morning Workload report that summarizes the status of benefit claims in its inventory, the backlog, and the accuracy rate of their claims. But even more interesting, Paul Lawrence, undersecretary for benefits at the Department of Veterans Affairs, has begun quarterly “progress and results” reports to the VA’s external stakeholders including veterans, their service organizations, Congress, and even the department’s own employees. He videocasts a live, personal report that is brief and fact-based. He lays out the progress made over the previous quarter as well as planned next steps. He flags and discusses problem areas, not just success stories, and explains the cause of the problems and steps being taken to fix them (full disclosure: Paul Lawrence was one of the founders of the IBM Center!). His first was in October 2018 and it is available on YouTube for replay. It is 20 minutes long and has had 12,000 views. His most recent quarterly report was last week and it is also archived on YouTube. Would his example be worth making it a routine practice across the government? Would there be an audience interested in knowing what is going on at the National Institutes for Health? The Federal Energy Regulatory Commission? The Patent and Trademark Office? Note: This is the first of two posts about how the story of how the work of government is being communicated to Americans.